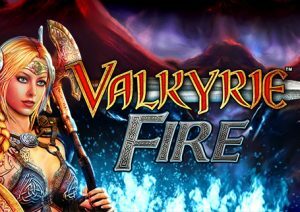 Valkyrie Fire is an intricately designed Norse myth and legend themed video slot from Barcrest. Played using a 5 reel 10 payline game engine, it comes with wilds that double payouts and a free spins round complete with stacked wilds. Play on all devices from between 10p and £500 per spin. The design in Valkyrie Fire is very impressive. With the aurora of the northern sky in the background the reels are set within the frame of a Viking longship. On the reels you’ll see Norse-style A to 9 royal values alongside ravens and wolves, a Viking longship and Loki and Odin. Both of the latter award 75 times your bet if you land 5 on a payline. By far the best paying symbol is the blonde-haired Valkyrie who is the game’s wild. It replaces all other symbols apart from the scatter. Land 2, 3, 4 or 5 wilds in combination and you can look forward to a payout of some 1, 10, 100 or 1,000 times your bet. Whenever the wild makes up part of a winning combination with a standard symbol, the payout receives a 2x multiplier boost and is doubled. The shield is the game’s scatter – land 3, 4 or 5 of these anywhere on the reels and you’ll pocket 5, 20 or 500 times your bet as well as triggering the Free Spins Bonus feature. On offer here are 10 free spins. The 2x multiplier wilds are in play here. Look out too for the Fire Stacked Wilds which can turn any of the 5 reels wild during each free spin. Some recent Norse-themed video slots have been very complex affairs (we’re looking at you Vikings Go Berserk) but Barcrest has kept things simple with Valkyrie Fire. The visuals are very high end but the gameplay is very stripped back. That’s not necessarily a bad thing of course. In fact, in this case it works rather well. Norse legend has become one of the most popular genres for slot game developers. There’s nothing earth shattering about Valkyrie Fire but the combination of classy design and simple features make it a very playable game – it does also offer payouts of 10,000 times your bet if you fill all reels with Fire Stacked Wilds! T&Cs Apply 18+. New players only. Min. deposit £10. Account balance is withdrawable at any time. Upon withdrawal, any remaining bonus spins are forfeited. 7 days to activate the spins. Bonus spins expire 24 hours after activation.<br> Play responsibly. Bonus – New players. Min. deposit £10. Wager req 20x. Bonus balance is paid with 10% instalments to account balance. Bonus balance is not playable. Max bet is £20. Account balance is withdrawable at any time. Upon withdrawal, any remaining bonus balance is forfeited. Play responsibly, begambleaware.org.